There's always a story behind every successful brand, and I've never heard one as beautiful as Pureology's brand story that it touches me so much and made me believe that there are always love and kindness in this world that we are unaware of, and we SHOULD aware of. 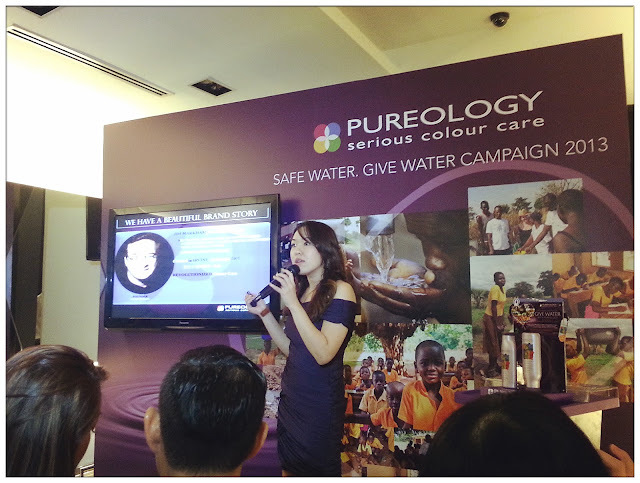 In conjunction with year 2013's World Water Day, Pureology has announced its innovational campaign which is called Save Water. 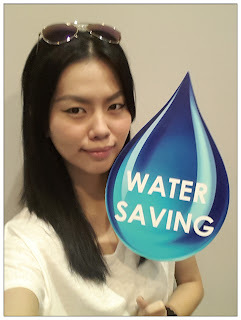 Give Water Campaign 2013. A series of campaign activities and efforts will be launch and the benefit made will be contribute for the communities who are in needs. 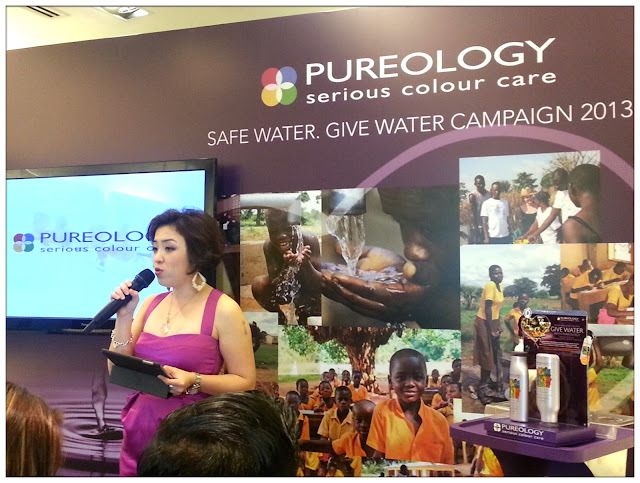 Water conservation is the biggest initiation for Pureology worldwide yearly since year 1998 and the brand has been partnered with Green Cross International (GCI) to sponsor and help the children and women in Ghana to enjoy safe drinking water and proper sanitation. It is real saddening that when some of us wasted all those precious clean water running from our tap without a lil bit guiltiness, children in Ghana have to walk miles and miles away from home to the nearest rivers just to get water for their daily use. Pureology is a pioneer in sustainability among all L'Oréal brands ever since L'Oréal corporation set its ambitious goals for waste, water and CO2 reductions. Sustainability is all about preserving the natural resources, the environment, benefiting communities and generating positive profits. L'Oréal Corporations has a heritage of environmental consciousness, using green botanicals and 100% vegan formulas since its inception. It is no longer about traditional marketing trend, but the future of business strategy. Whenever a consumer purchase products from this stunning collection, one Euro will go to the Green Cross International clean water program as part of the fundraising efforts. The vibrant artwork on those Limited Edition Hydrate packaging is actually a compilation of drawings by school children at the Makango School in Northern Ghana. The compilation drawings on the packaging and merchandise for this Limited Edition Hydrate range shampoo and conditioner touches the hearts of consumer. A video clip were showed to all the guests before the presentation of Pureology and seriously, the children and women in Ghana is living a hard life without clean water and personal hygiene is at its worst that it breaks my heart. In fact, 800 million people all over the world doesn't have access to clean drinking water and more than 1 billion people are lack of proper sanitation. At times like this I am thankful for being born as Malaysian, at least I have access to clean water and drinking water as well as proper sanitation system that others sees as a privilege in life. "I sincerely appeal to people everywhere to come to our aid, because we really need their support to make a difference in my region. People are suffering and I pray that they will come to our aid. "These words are said with tears by Sharifatu Yassif, a 21 years old assistant teacher from the Makango School in Northern Ghana. My heart breaks at the same time when she cried, hoping that more people in the world realize the difficulties they are in and hoping for help that can improve their lives. 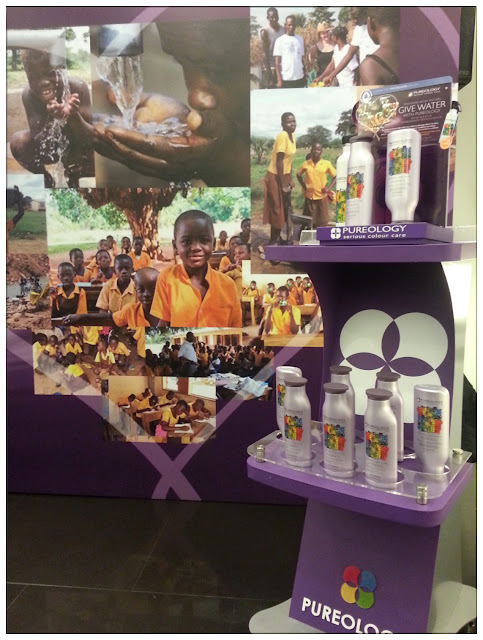 It was such a relief to know that Pureology is playing an important role and giving help to the children and women in Ghana and now they have access to clean water without walking miles afar. 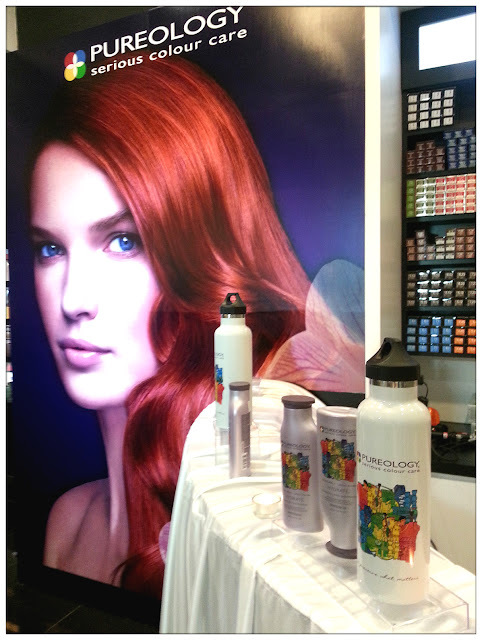 Pureology caters for every type of hair needs and care for the hair color that you into taking care of. Its 100% vegan formula are made with plant extracts and its AntiFadeComplex includes essential antioxidants to defend against colour-fading free radicals + full spectrum of UVA/UVB helps our colour-treated hair to stay vibrant as if we just step out of salon. All ranges of shampoo of Pureology are ZeroSulfate shampoos which are formulated naturally with ingredients such as coconut, corn and sugar which gently cleanse our hair scalp but at the same time maximize the colour retention of our coloured hair. The founder of Pureology Jim Markham created the brand on behalf of his beloved friend, who is a cancer patient but still loves to make herself pretty by dying her hair. The harmful ingredients in conventional shampoo made her suffer and there's where Jim Markham started to create Pureology, a ZeroSulfate shampoo which uses natural ingredients to protect coloured hair and also, protects our natural hair colour away from the damage. Such a good brand for hair colour protection at the same time contribute to the Green Cross International. 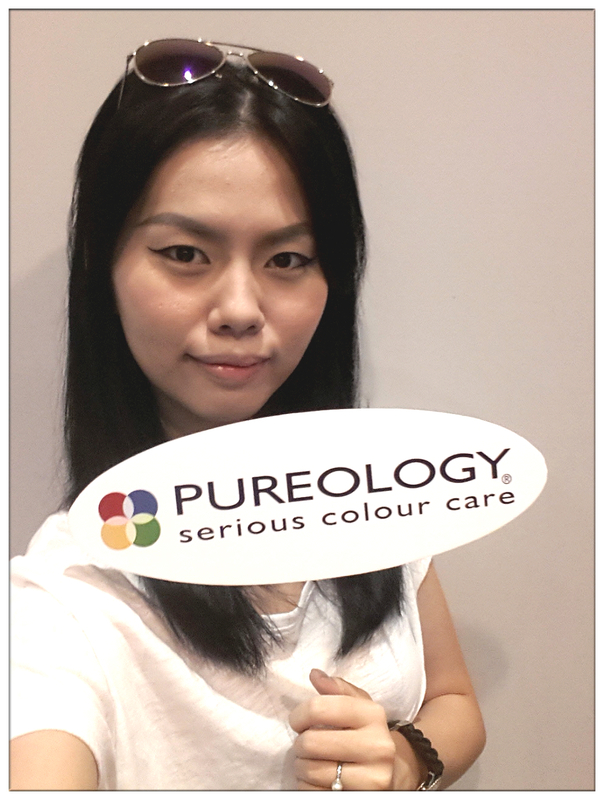 With my girls at the Pureology Save Water Campaign 2013. With Jojo Stuys and Ning Baizura who graced the event with their appearance. 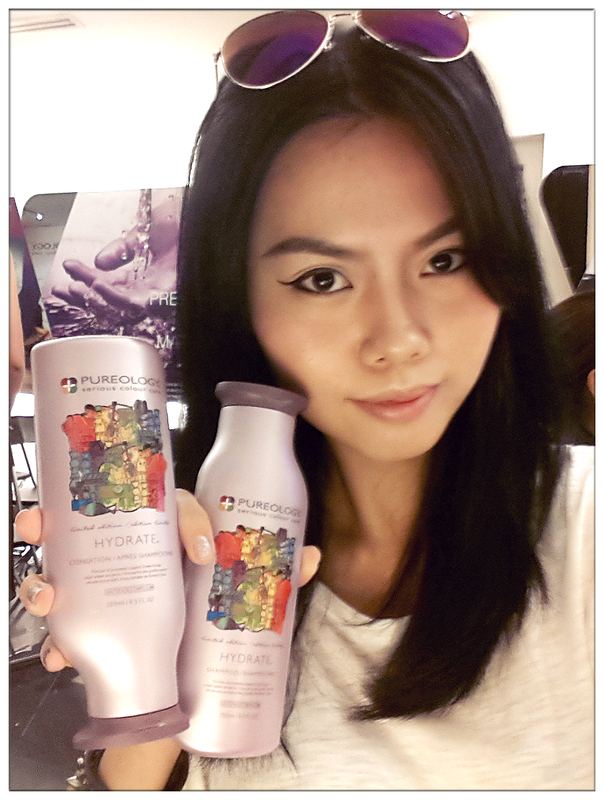 Thank you to the L'Oreal Malaysia and Pureology team who organized this event, to once again reminds of how grateful we Malaysian should be to have unlimited supply of clean water to our house everyday, to have clean drinking water without having to suffer and walk just to get a bucket of water. Please be thankful of what we have and cherish them while they're still available. Save water, and give a bit of your support to those who are in need! Water Saving is the IN thing! Don't forget to do it everyday, for a longer sustainability for us, and the next generation. Get yourself a bottle of Pureology shampoo and conditioner to experience the Sulfate-Free hair washing and long lasting hair colour with radiant shine. Available at selected hair salons.